This demo surveillance video illustrates the HD resolution capabilities of the HD-BL8 1080P HD bullet security camera in both day and night applications. The HD-BL8 is a high definition bullet security camera with an adjustable 3.5 to 16mm lens. In this first video segment the camera lens is adjusted to the 3.5mm setting, which is the widest angle. The cardboard characters are positioned 9 feet in front of the camera and the camera is mounted 9 feet high. The door that Mike entered from is 32 feet away from the camera. This is a fairly large room that measure 29 feet by 28 feet. In this next video segment, the cardboard characters were moved back to be 29 feet away and the camera's varifocal lens is adjusted to the 16mm setting. This is the most zoomed in and narrow angle of view that the camera supports. Please note that this is not a license plate recognition type camera. We are using the license plate to show how well the camera can focus on distant objects by adjusting the lens setting. The lens can be adjusted and focused to any angle between the 3.5mm and 16mm settings by turning these angle and focus rings. The HD-BL8 is a hybrid security camera that supports 4 video modes. Installers can easily select AHD, HD-TVI, HDCVI, and Analog CCTV video modes using the included joystick that is easily attached to this RCA input on the camera cable. To capture this surveillance footage in this video, the camera was in 1080P HD-TVI mode and recording to an iDVR-PRO surveillance DVR. The HD-BL8 is enclosed in a weatherproof housing so that it can be used for indoor and outdoor video surveillance. The sun shield can be installed if you plan on mounting the camera outdoors. The tri-axis mounting bracket that is included supports ceiling and wall installations and allows the camera to pivot in any direction. 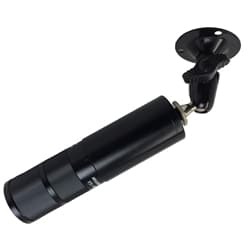 Click here to learn more about the HD-BL8 1080P HD Bullet Security Camera used in this video.